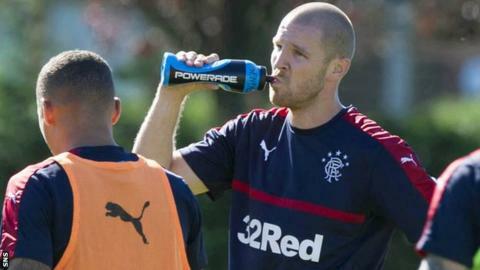 Rangers have completed the signing of former Arsenal defender Philippe Senderos on a one-year contract. The 31-year-old had been on trial with the Ibrox club after leaving Grasshoppers in his Swiss homeland. Senderos looked like he would miss out on a deal when Rangers were poised to sign Joleon Lescott from Aston Villa. But the former England defender failed a medical and Rangers manager Mark Warburton has turned to the man capped 57 times for Switzerland. Having started his career with Servette, Senderos spent seven years with Arsenal before spells with AC Milan, Everton, Fulham, Valencia and Villa. He made 14 appearances for Grasshoppers as they finished fourth in the Swiss top flight, having left Villa Park in January, but was left out of his country's squad for this summer's Euro 2016 finals. Meanwhile, Rangers have released Andy Murdoch after the midfielder's contract was terminated "by mutual agreement". The 21-year-old came through the youth ranks at Ibrox and made 22 appearances for the Glasgow side. However, he ended last season on loan to Cowdenbeath in the Championship and has not featured under Mark Warburton this season.